Based on the patented KDM System, the Solar+ line of two-stage solar concentrators introduces an all new technology to the CSP industry. This solar concentrating method provides a number of advantages over traditional CSP technologies. The novel method is highly efficient, (about four times more efficient than flat plate solar collectors). 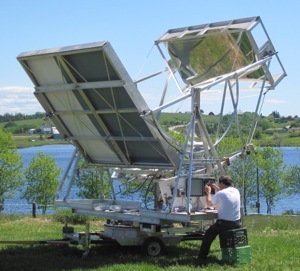 The versatile design opens up a number of the new solar applications that haven't been possible with traditional CSP technologies. ProSolarTec is pleased to offer 4 different sized units available for industrial, commercial and residential applications. Please find the list of Solar+ units in the side menu where Some technical information is provided. Each Solar+ unit has its own special purposes and applications. The 2011 Brochure can be downloaded here. For more information on availability & and applications please contact us.